Next time you visit Boston, skip the typical clam chowder and avoid the baked beans. Instead stuff your face with rich, chocolaty desserts and hearty sandwiches from restaurants all across the city. Stop by one of Tatte’s six locations to try one of the most perfect slices of cake you will ever eat. 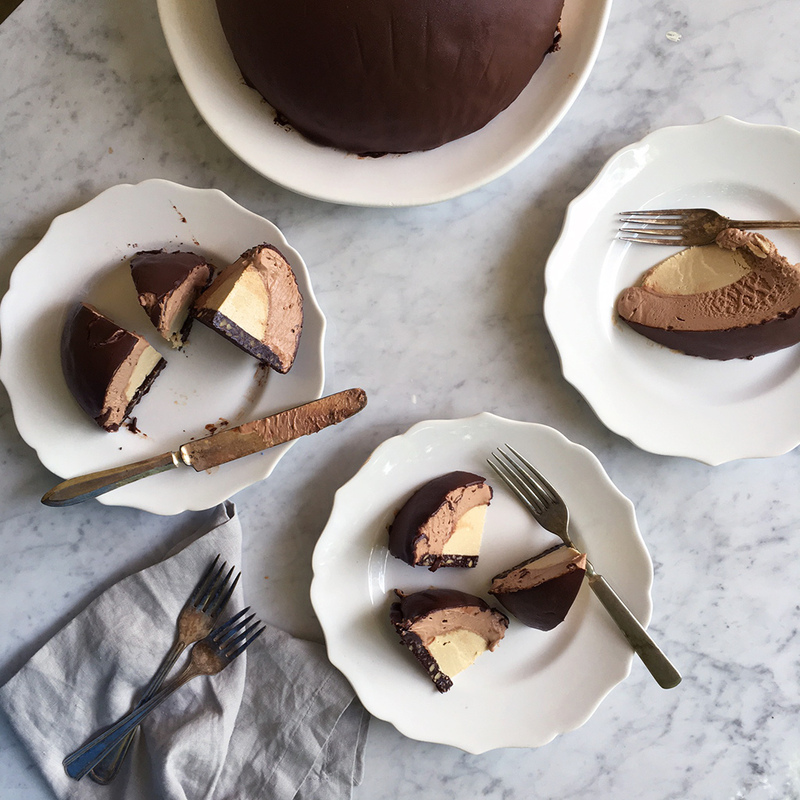 This chocolate dome is comprised of three layers – creamy halva in the center surrounded by a thick layer of chocolate mousse and a coating of dark chocolate ganache. It’s a chocolate lovers dream come true. At $3 a slice you could probably feed two to three people, but then again why would you want to share? Boston is not widely known for it’s sandwiches, but Cutty’s is looking to change that. This little shop in Brookline rolls out elevated sandwiches filled with hand stretched mozzarella, slow roasted roast beef, and imported finocchiona. But the sandwich you must eat is the massive Roast Beef 1000 priced at a mere $9.95. The black pepper bun, from local bakery Iggy’s, is loaded with a mammoth portion of thinly sliced beef, cheddar cheese, crunchy fried shallots and the most perfectly spicy horseradish-spiked Thousand Island dressing. You’ll be dreaming about this sandwich for lunches to come. Walk down Union Street—a mere block over from Quincy Market—and you’ll find Boston’s best French fries. The hand-cut russet potatoes are fried twice to get that perfectly crisp exterior. Their famed poutine is smothered with housemade gravy and salty cheese curds. You can smell the truffled mushrooms from the doorway and they are a necessity on the poutine. Pair your poutine with a sweet treat like bite-size liege waffles dusted with extra pearl sugar and wash it down with a dark chocolate and hazelnut beer float. Right behind Fenway Park is the BBQ joint to feast at before a Red Sox game. Offering trays of smoky pork belly, slabs of St. Louis style pork ribs and prime beef brisket, this place is not messing around. Make sure to start your meal with a basket of warm, flaky biscuits the size of your head that should be smothered with sweet and salty honey butter and complete your tray with a scoop of broccoli cheese casserole and another of carrot raisin salad. Giulia boasts a vast selection of freshly made, hand rolled pastas, but if you have to choose one, go for the pappardelle with wild boar. The pasta is loaded up with tender boar and finished with black trumpet mushrooms, juniper and salty parmigiano. And if you manage to save room for dessert you can’t leave without trying the creamiest pistachio gelato topped with marinated cherries and a crunchy anise pizzelle. This food truck turned brick and mortar serves up locally sourced, creative Chinese-American food. The family restaurant is best known for the Double Awesome sandwich – Vermont cheddar cheese, two slow poached then fried eggs, and local green pesto sandwiched between two crispy fried scallion pancakes. If you want to get a little crazy you can add bacon, ham or turkey and then smoother it in spicy Sriracha ketchup. Just make sure you have extra napkins on hand – it’s a messy one. The must-try pizza is one that head chef Jeff Pond created almost 14 years ago. This wood fired pie is topped with shiitake mushrooms, nutty fontina cheese, gremolata and finished with two eggs. The result is a charred pizza with runny yolks that takes three minutes to bake and less than two to inhale. This is the most delicate and buttery swordfish you will ever have. It’s lightly charred and slightly sweet; the fish is served on a generous portion of coconut cilantro rice with an equally massive serving of jumbo lump crab and a mango papaya salad. It’s a fresh, bright dish that can make even the biggest swordfish haters change their mind. There’s also a variety of margaritas ranging from sweet to spicy to refreshing for your sipping pleasure while you chow down on chips and mango guacamole as you wait for the fish. Brown sugar, brown butter and brownie. That’s what makes up the creamiest, fudgiest ice cream at Boston’s best ice cream shop. With chunks of rich chocolate brownie and hints of nutty brown butter, it is the ideal treat for anyone with a sweet tooth. Brownie not your thing? Toscanini’s also churns out unique flavors daily like orange burnt caramel, lime marshmallow and chicory. Inside the old school style candlepin bowling alley, Sacco’s Bowling Haven is a bar pouring local craft beers and The Flatbread Company making crispy, cheesy flatbreads. Order a beer and the Mopsy’s Kalua Pork Pie – smoked pork shoulder, homemade mango BBQ sauce, sweet pineapple, red onion, goat cheese, whole milk mozzarella and parmesan – and grab a lane. Once you’re done with your flatbread and your bowling, move over to the restaurant and finish the night with Sarah’s Chocolate Chip Banana Bread that’s warmed up in the wood fired oven and topped with chocolate ice cream, homemade chocolate sauce and whipped cream.